N.Nikopoulos et al. "An efficient algorithm for 3d binary morphological transformations with 3d structuring elements for arbitrary size and shape". IEEE Transactions on Image Processing. Vol. 9. No. 3. 2000. pp. 283-286. This filter is maintained for backward compatibility. It is now a subclass of BinaryDilateImageFilter (the fast incremental binary dilate algorithm is now in BinaryDilateImageFilter). Definition at line 52 of file itkFastIncrementalBinaryDilateImageFilter.h. Definition at line 75 of file itkFastIncrementalBinaryDilateImageFilter.h. Definition at line 66 of file itkFastIncrementalBinaryDilateImageFilter.h. Definition at line 68 of file itkFastIncrementalBinaryDilateImageFilter.h. Definition at line 67 of file itkFastIncrementalBinaryDilateImageFilter.h. Definition at line 74 of file itkFastIncrementalBinaryDilateImageFilter.h. Definition at line 71 of file itkFastIncrementalBinaryDilateImageFilter.h. Definition at line 73 of file itkFastIncrementalBinaryDilateImageFilter.h. 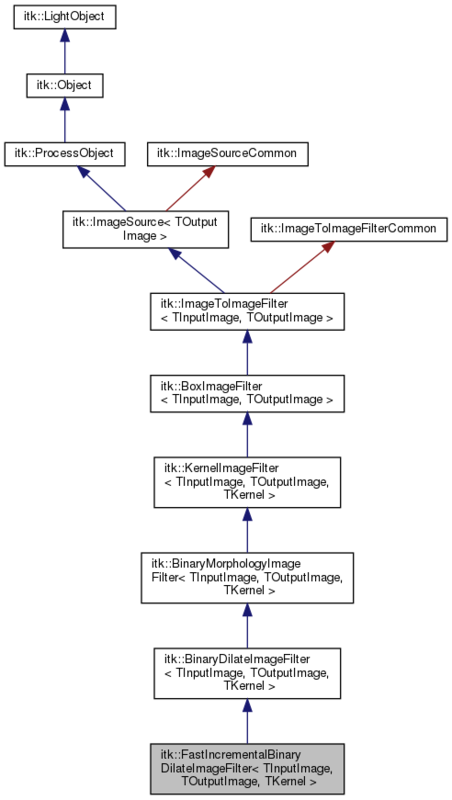 Reimplemented from itk::BinaryDilateImageFilter< TInputImage, TOutputImage, TKernel >. Extract dimension from input and output image. Definition at line 59 of file itkFastIncrementalBinaryDilateImageFilter.h. Definition at line 63 of file itkFastIncrementalBinaryDilateImageFilter.h. Definition at line 60 of file itkFastIncrementalBinaryDilateImageFilter.h.